2018 is over. 2019 is before us. This article is a little different, but I hope you enjoy it. It’s my wandering ode to the changing of the years—and some words of inspiration to those who might be ending this year tired or feeling down, those whose flame is burning low. Sometimes, it can be easy to feel like we’re not making progress. Like the problem is too big. Change happens slowly. Even if day by day it’s hard to feel any progress being made, we’re pushing the flywheel and building momentum. The important thing is that you stick with it. To remember that you’re making a difference, and that you’re not alone—there are hundreds, thousands of other people in this movement working with you. It’s good to remember that as often as we’re down, others are down too. We all feel the same things, though we may feel certain things more strongly or weakly than others. If you know anyone who needs to be picked up a bit, who’s feeling overwhelmed or thinking about giving up, reach out to them. Tell them that it’s okay to feel overwhelmed. I’m not doing enough. I could work longer days, I could work more on weekends. I’m not working on the right things. The things I’m doing won’t push us toward ending animal exploitation. I feel like the things I’m doing don’t matter. We as a movement aren’t making progress. We aren’t significantly reducing suffering, and we’re not getting close to fundamentally changing the relationship between humans and other animals. There are so few of us who care, and even fewer still who actually take steps to solve the issue. The problem is too big. Maybe it’s unsolvable. The down days come, and that’s okay. “Never quit on a bad day,” the quote goes. There are plenty of up days too. No definitive statement about the future is true, because the future hasn’t happened yet. Future events are subject to all the incredible twists and turns of the progression of the universe, especially when there are humans involved. Nothing is inevitable, whether good or bad, although some things can certainly be more or less likely than others. In fact, our attitudes about things are often what serve to create the future. Our views can be self-fulfilling prophecies. As that one quote says, those who dare to try to create the future are the ones who do. Individuals can and do change the course of history. Individuals like you. Of course it is very helpful to take a hard look at our current success. It’s good to acknowledge the facts. But it doesn’t make sense to attach any judgment or emotion to it unless those things are useful in getting us closer to achieving the goal—and it certainly doesn’t make sense to impose arbitrary limitations on what we think is possible. I’m not going to say that doubt and self-criticism are never useful. I personally think that many good things in my life have come out of intense doubt and self-reflection about the value I’m adding to the world. How can we choose an effective path forward if we aren’t critically-minded about our selection? But the key is that these things are only good to the extent that they’re useful and constructive. Wallowing in self-doubt for weeks and months, or constantly dwelling in debilitating negative self-talk, are almost surely destructive. We have a lot of work to do. We’re not winning, yet. There is immense suffering that’s hard to watch, hard to listen to, hard to fathom. But there’s also a lot to be hopeful about. First off, you and I are not alone. You’re not the only person working on this issue, you’re not the first person working on it, and you certainly won’t be the last. This knowledge should give you the freedom to step back and look at what’s truly important, not only what’s urgent. You don’t have to try to solve all of the problems, because there are thousands upon thousands of people thinking about and working on all kinds of issues, all around the world. The people at Memphis Meats are trying to make meat without killing animals. The people at the Nonhuman Rights Project are fighting for fundamental legal rights for nonhuman animals. People at Animal Equality and Mercy For Animals are conducting undercover investigations and spreading the footage far and wide online. Staff and volunteers with Vegan Outreach are handing out millions (millions!) of leaflets every year. And for every full-time paid staff member of one of these organizations, there are 10—maybe 100, or 1,000, or 10,000—people who are advocating for animals in small and large ways in their everyday lives. There are people dreaming up new initiatives. There are people starting new organizations. There are people working constantly, day and night, for animals. People like you. Should you dream big? Of course. We need everyone to be thinking about how we can actually get this thing accomplished on a national and global scale. But you don’t need to run around frantically. You can be deliberate. You can be thoughtful. We need you to be thoughtful about your work. We need you to try to actually create the biggest world-changing difference for animals. Starting with the first step, and continuing step by step, day after day. Second, we are making real progress. In 2018, laws for animals were passed. Companies made commitments to change their practices solely for animal welfare reasons. Vegan products continued growing. Veganism became even more of a household term. Animals were rescued. Tons of media attention was earned. More activists came into the movement. More people went vegan. We continued pushing. You and I are still here. Those are two of the biggest wins we could’ve possibly had. Truth be told, there will always be big problems to solve—this is something I came to terms with recently. Even if we were to end all animal farming tomorrow, there would still be a lot of suffering in the world for us to try to make progress on. So we should always celebrate the progress we’re making while continuing to look forward to doing more the next year. Finally, I don’t know about you, but I have no intent of stopping soon. I feel, like many do, that this is my life’s work—and I won’t stop until we reach the finish line. Next year, we will keep working. The year after that, we will keep working. And we will keep making progress, and we will keep pushing humanity forward, and we will keep creating a better world for all. And though some people will leave the movement, many more will stay—and many more will join. And year by year, day after day, we will accomplish this. And that gives me hope. And it gives me enough fuel to keep the fire burning for 2019. Now is a good time to say that if you’re ever feeling the need to just reach out and connect with another advocate, please consider me a resource! I’m always down to have a phone chat with those who are dedicating their time to helping animals. Here are some more 2018 recap resources, if you want to catch up on everything we’ve accomplished together! The Animal Movement Project (AMP) is a platform dedicated to building the movement for animals. We share thoughts and ideas that can take the movement for animals from x to 10x. Our focus is predominantly on animals exploited for food since they account for more than 99% of the animals exploited by humans. The topics covered are often about ways to tie the pieces of the movement together or to fill in the gaps. We focus on connecting people, ideas, and resources to each other. Imagine Los Angeles in the summer, June of 2019. It’s hot outside—sweaty, breezy, beach weather. People pack the coasts during the day and wander the streets at night, hopping from restaurant to bar, from bar to other bar, from other bar to food truck. It’s in this vibrant setting that the first Los Angeles Vegan Meat Competition is held. Local chefs and food scientists have been working for months to perfect their recipes for the competition—celebrity chefs like Marcel Vigneron of the restaurant WOLF and Betty Fraser of Grub; food scientists like Ted Russin; and food entrepreneurs like Amelia Posada. And the thing that’s similar about all of these individuals? None of them are vegan, or even vegetarian. But despite diet or beliefs about animals, everyone loves a good competition, and these foodies are in the business because of their love for…well, good food. They, and dozens of other competitors, are in the Los Angeles Vegan Meat Competition because they like challenges, and because they want the chance to beat out everyone else for first place. The media attention alone is good enough, not to mention the drama and controversy around some of the meat-loving chefs entering a vegan food competition. Not only that, but these people own businesses—new recipes are good for them, and the vegan community is a thriving base of consumers. From a strictly economic standpoint, it’s a no-brainer for them. This is the beauty of competition: It can bring people together around a common purpose based solely on the spirit of besting each other and accomplishing a challenge, even if the competitors might not care as much about the object of the competition. The result? A fairly easy way to make friends out of unlikely folks for a short time, to get media attention around the animal-friendly (vegan) future of food, and to create a huge amount of new products in a short amount of time. The only problem, of course, is that for the time being the Los Angeles Vegan Meat Competition doesn’t exist. It’s just a story in our imaginations, in this article. But it could exist—and hundreds of other vegan product creation competitions could exist too, in every city around the globe. Not only that, but dozens of other types of competitions could exist. Competitions to create new forms of animal advocacy. Competitions to saturate a city with anti-speciesist education. Competitions to create new organizations and institutions that help us build a food system without exploiting animals. Everyone loves a good competition. Maybe the first competition is to see who can create the second one. Not all behavior change is created equally. Let’s say you have $1,000. You could take that $1,000 and stash it under your bed for the next couple decades. Each passing year, everything in the world would get slightly more expensive—inflation would be at work, slowly increasing the prices of everything. Your $1,000 would deteriorate in value, losing purchasing power. Or, you could invest that $1,000 in a simple savings account, something with a very low interest rate. Over time, you would slowly accrue interest—not a ton of interest, but about enough to counteract inflation. This would be a bit smarter than stashing it under your bed, and your $1,000 would retain about the same amount of value that you started with. But what if you were to take that $1,000 and actually invest it in something? A first obvious and pretty standard option is investing it in a diversified stock and bond portfolio with a certain risk profile, something that more or less guarantees decent returns without too great a risk of losing your money. (Nevermind all those stock market crashes.) Your money would grow some small percentage each year, but that growth compounded over a couple of decades would yield significant growth. In fact, given decent returns you could expect your money to double in about a decade, maybe less. Side note: I’m not a financial advisor. You could just as easily invest in a company you believed in, or invest in your own project. Investing $1,000 into creating your own vegan waffle business could yield thousands of dollars and a solid company if you put in the time and effort. However you do it, these investments (if made wisely) can greatly increase the value of that original $1,000, transforming it into something much bigger than what you started with. Your money can be self-replicating—money can make more money. As it is with money, so it is with vegans. We’re going to be talking about “creating vegans” here, but you could think of it as empowering people, creating activists, helping people become animal advocates, etc. Whatever floats your boat. The main question is: how can you make your impact compounding, or self-replicating? We can create vegans who eventually go back to eating animals. This is deteriorating impact. It’s like a wooden fence that rots in the weather over time, or that money you stashed under your bed. In this situation, we’re losing value over time, undoing previous work. 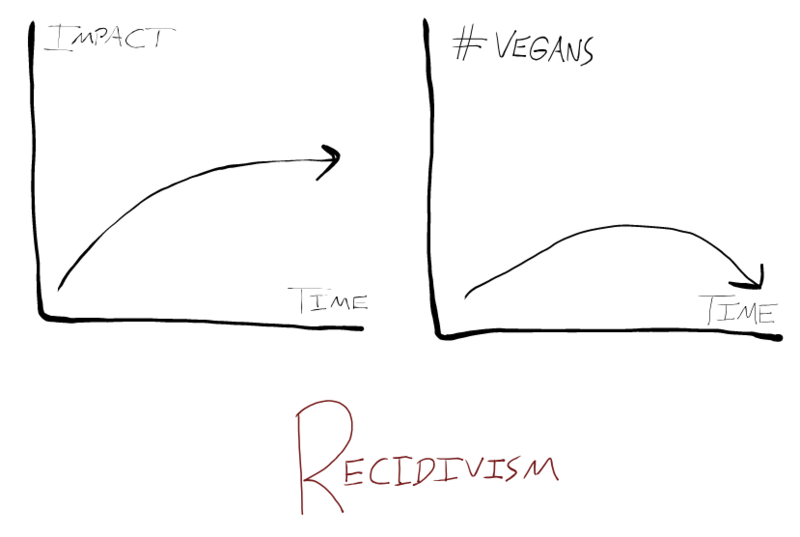 We could also create vegans who stay vegan, such as by focusing on reducing the recidivism rate. This is flat impact. It’s like a wooden fence that we coat with weather protectant wood stain, so that it stays pretty much the same for years—or like the money we invest in a simple savings account, gaining a little bit of interest each year. Or, we can create vegans who create other vegans. This is compounding impact. It’s like investing money in developing a wooden fence that creates other wooden fences, or a wooden fence that starts a wooden fence company for you and makes you thousands of dollars in profits. 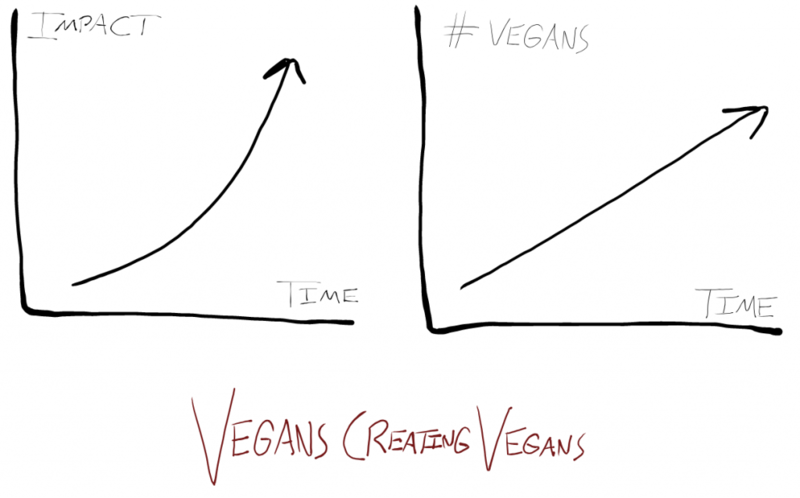 Let’s say we put some finite amount of energy into creating new vegans. What kinds of returns do we get in each of these scenarios? Say we work for some length of time on getting people to go vegan, maybe a decade. Maybe we get 10 new people to go vegan each year because of our work. But, because of recidivism, maybe all 10 of those people go back to eating animals the very next year. After a decade of work, we’ve gotten 100 people to go vegan for a short length of time, but then everything goes back to the way it was before. Our return on investment in this scenario is very small, and finite. As soon as we stop doing work, our impact stops. Everything goes back to normal and it’s almost like nothing ever happened. If we say each person in the US is responsible for the deaths of approximately 300 animals due to food (including fish, bycatch, etc. ), then that’s 300*100=30,000 animals spared. Obviously, this doesn’t sound like a very good way to create lasting change for trillions of animals globally. Let’s assume we put in the same amount of work as last time, with the same results—we work for a decade, influencing 10 people a year to change their behavior to help animals—so we still end up with 100 people who have gone vegan thanks to our influence. But in this scenario, all of those people stay vegan indefinitely. After you stop working, there are still 100 people out in the world choosing to not eat animals. They’re not influencing other people, but they’re still responsible for sparing those animals from being brought into the system. If we still assume 300 animals spared per year per vegan, then each year these 100 people keep another 30,000 animals from being born, raised, and killed. After ten years, that’s 300,000 animals. After thirty years, it’s almost a million. Your return on investment keeps growing year after year while all of those people are still alive. Your impact in this scenario lives on even after you stop doing work, which is much better than the first scenario. 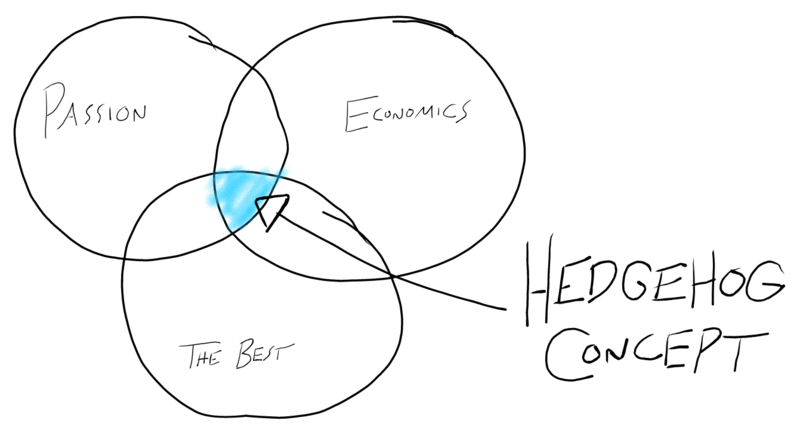 This is the compound interest scenario, the holy grail of what we want to accomplish. Imagine that whenever we influenced someone to go vegan, they then started influencing other people to go vegan. And imagine that those new people influenced others… and so on. Let’s say you spend a decade getting 100 people to go vegan, then you stop working—you retire from activism. Well, those 100 people are staying vegan, just like in the last scenario. So their personal impact keeps growing. But now, they’re also constantly influencing others. Let’s say instead of influencing 10 people a year like you do, they only influence 1 person per year. The year after you stop working, your original 100 influence another 100 to go vegan. The next year is another 100. Then another 100. Your original impact essentially multiplies itself every year, making your original investment way more impactful. Instead of adding on 100 each year, we’re now doubling the number of vegans each year. Assuming this trend were to hold true for twenty years, you would be personally responsible for kicking off a chain of events that led to 100,000,000 new vegans, which would reduce the total number of animals killed each year for food by 1.3%. Not bad for one person putting in ten years of work. While this is obviously a contrived example, this is the basic power of compounding, self-replicating effects. The real question is, how can we set up our work in a way where we maximize the chances of achieving these kinds of compounding effects? No matter the type of work we’re doing, there are ways we can increase these odds. Currently, a lot of our approach to individual outreach and volunteer engagement looks like “let’s get this person to do this one specific thing.” That specific thing might be changing their diet, or leafleting, or protesting. But our goal is usually measured in terms of how many people we’ve gotten to do that thing. The best case scenario for this type of work is “flat impact”, although “recidivism” is more likely in most cases. Many people will stop doing the thing we want them to do, like go vegan. Out of those who continue doing it, very few will make the leap to the next step—teaching others to do what they do. “Teaching people to teach” is exactly how we can focus our efforts to have a bigger impact. Second, if we think that the majority of people wouldn’t like the approach stated above, we could still invest more of our time and energy in identifying those who would be interested in helping out. When we notice someone who is particularly interested, we can spend more time talking with them. We could figure out ways to connect with people who are always coming back to our websites or social media pages. We could create new programs just to find those people and help them get active and stay active. Technology is an amazing tool that can help us. We could hold “digital conferences” on any topics we want, essentially for free, using video call / webinar technology. We can build applications and websites that help people connect and learn. Even old means of communicating with large groups of people like phone trees can be recreated, improved, and tested using modern digital technology. And whenever we find ourselves helping someone, we can ask “how can they now help others?” And so on. If your current ability is at X and you never focus on getting better, then you’ll perform at X this year and next year. Ten years from now, you’ll still be at X—you might have even decayed to something less, like 0.7X. Best case scenario, maybe you’re at 1.5X or 2X, if you’ve picked up some new techniques here or there. However, if you focus on constant improvement then you unlock the power of compounding effects. 1% improvement every day for a year takes X to 37X. 1% improvement every day for a decade takes you from X to 5,929,000,000,000,000X. That multiplier is a number so high you and I don’t even know the word for it. Self-improvement and constant learning aren’t a nice-to-have. They’re essential for anyone who wants to make a difference in the world. As individuals, our time on this earth is very limited. However, there are ways that we can “cheat death” and extend our own personal impact far into the future. One of those ways is through the establishment of institutions. If you set up an institution with a framework for operating and a means of sustaining itself, it can go on to become its own self-replicating organism. One example of this is organizations like Mercy For Animals or Vegan Outreach. These groups are legal entities, there’s an official board of directors helping to guide the direction of the organization, and there are structures in place that more-or-less ensure that funding will come in, people will get hired, etc. The official structure provides stability, and the momentum invested in the organization over the course of a decade or more creates an inertia that can carry it forward into the future. In our movement, The Vegan Society is one of the longest lasting entities—founded in 1944 and continuing to operate to this day. There’s a lot more work to be done in this area. Keep this question in mind: how can I create compounding, self-replicating impact with the work I put in? If I were to stop working right now, would my impact for animals deteriorate, stay stagnate, or keep growing? How could I make it build on itself and grow even faster? None of us lives forever. How are you going to make sure your impact for animals lives on after you’re gone? It’s rare for different flanks (groups? sides?) of the movement to talk to each other—what you may not know is how much people on different sides don’t even use the same language. This week is going to be a short one, but I think it’s a good topic to chew on. A few days ago, I was catching up with a close friend from “the other side” of the movement. We’ve both devoted our lives to helping animals as much as possible, but the groups we each work with don’t usually interact at all. As we were drinking our tea (gong fu style), we got to talking about the various differences between our groups and the circles we run in. One of the things we’ve realized is that our respective groups of people don’t even think or talk about the work we’re doing in the same way. In many cases, we use different words for the same things. More often, though, we’re using different concepts that don’t even really exist on the other side. As one example, my friend kept mentioning “activist transformation” as being one of the primary goals of organizing people. “How would you talk about it?” he asked. Another example is how much our work is grounded in and guided by various theories. My friend (and many people on that side of the movement) is completely grounded in theory. The theories come from prior social movements, they come from sociological research, they come from studying people. But everything that he thinks about comes from theories, or is constructed and framed in terms of theories. If you walk into a room where people are discussing strategy, chances are some lessons from history are going to come up. Meanwhile, it seems like those on this side of the movement rely more on piecing evidence together in a general direction, and in thinking about what needs to be done within a certain context. There aren’t necessarily full theories of change behind the actions, and people aren’t usually reading books about other social movements or discussing the trajectories of other social movements. If you walk into a room where people are discussing strategy, chances are they’re discussing metrics and research, data and impact estimates. Here are some terms or phrases I’ve noticed that indicate other differences in language between the various groups in the movement. Some of these terms are used almost exclusively by certain groups, and some are a little more universal. Now, I’m not saying that certain phrases or ways of thinking are necessarily right or wrong, better or worse. It’s fine for different groups of people to have their own terms and language and to understand things through their own different lenses. In fact, it’s probably good and healthy for the movement to have this kind of diversity. But what we’re currently missing out on is the added value of learning from each other—the creativity that comes from taking two fairly different things and forcing them to interact. My challenge to you for this week is to find someone from a “different side” of the movement, or a different group at the very least. Reach out to them and see if they’re interested in having a conversation. Talk to them about how they think about things. What language do they use? What ideas and resources do they come back to most often? What can you both learn from each other? And don’t stop there. Keep this in mind anytime you run up against an idea in the movement that you aren’t familiar with, or that you aren’t comfortable with. Discomfort is just a sign that you have the opportunity to learn something. I’ve created an anonymous feedback form so that you can give me any kind of feedback you’d like. If you’ve read a couple of AMP articles now, send your thoughts my way. You can also contact me the usual way. I have the good fortune to scale the walls at the same climbing gym as one of the great modern business authors of our day, Jim Collins. I recently finished reading his 2001 book, Good to Great, and thought the lessons about how to transform businesses could apply to organizations within the animal movement. I’m going to give you a rundown of the six big takeaways of this book, but if you have a solid reading habit this is a good book to read in full. Jim takes a strictly research- and data-oriented view to his studies of business. For this book, he identified companies that had a long period of average (“good”) performance—as measured by stock market returns—followed by a long period of exceptional (“great”) performance. He and his research team identified eleven companies that fit the bill, across all kinds of industries. For each of these eleven, they then identified a comparison company in the same industry that hadn’t made the transition to great performance. The main question they asked was: What makes these two groups of companies different? Why did the one group reach outstanding performance while the other group failed to do so? I’m going to talk about the main idea behind each of these principles, and then offer some brief thoughts on what takeaways there are for the animal movement. Since we are, relatively speaking, still a very small and young movement, I think there’s a lot we can learn from books like Good to Great that conduct very rigorous analyses of much larger and more established entities. So what does it take to become great? Jim and his research team didn’t even want to discover that executive leadership mattered. “Make sure not to overemphasize the role of the CEO,” Jim told his team, because of how much the CEO is often over-emphasized as being a key part of an organization’s success. But over and over again, they kept seeing something they came to call Level 5 Leadership. Personal Humility. These leaders don’t have giant egos, and they aren’t celebrities. They share credit with others, and accept responsibility when things go wrong. Professional Will. Despite their humility, they will do anything and everything necessary to make the organization successful. They care deeply about results and success—not their own personal success, but the success of the organization. 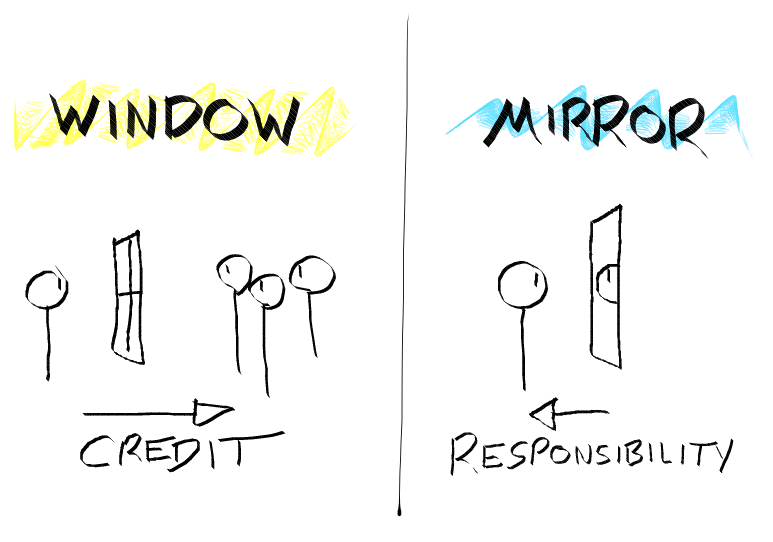 These leaders embodied the window and the mirror: They looked “out the window” at everyone around them to allocate successes, but they looked “in the mirror” at themselves when things went wrong. They shared credit and took blame. This is in contrast to many leaders at the comparison companies, who did the opposite: taking credit for successes and putting blame on the staff, the industry, or “bad luck”. We should be careful about our use and fondness of charismatic leaders with big egos. We should also be wary of the “lone genius” who has all of the great ideas that an organization then simply executes. Charisma can motivate people for a short time, and lone geniuses can be very effective while they’re around. But to have an outstanding long-term impact, a culture of results and intelligent decision-making have to be baked into the fabric of the organization. People at all levels need to know how to act in order to have the greatest impact for animals, rather than simply following the directives of a single commander. This is unlikely to happen if those in leadership are driven by their egos and want to take all of the credit for success. When choosing new leaders for organizations—and when thinking about what kind of leader you can be—think of the combination of personal humility and professional will. Don’t start with what exactly you’re going to do. Start with who you’re going to do it with. When in doubt, don’t hire. Limit your organizational growth based on how many good people you can find, and hire good people even if you don’t have anything for them to do yet. When you know something needs to change regarding people, act quickly. But before letting someone go, make sure they’re not just in the wrong seat on the bus. Put the best people on big opportunities, not big problems. One idea that’s brought up again and again in this book is that good teams will debate and argue passionately about decisions in order to find the best path forward, but once a decision is made everyone gets behind it (essentially “disagree and commit”). As a movement, we’re often very focused on the what—what we want to do to change the world for animals. Having this vision is incredibly important of course, but how exactly we get there can look like a million different things. We should also encourage more vigorous debate in search of truth. We can’t just nod along in agreement, unwilling to challenge or explore ideas. To discover the best way forward, we’re going to need critical thought. We can’t incorporate everyone’s perspectives and knowledge unless we’re willing to be critical and challenge each other. But for that to work, we also need more “disagree and commit” in our movement’s culture. I’ve seen many instances where people do disagree but aren’t willing to commit once something has been decided. Find the right people, and get them in the right seats. Debate vigorously, then “disagree and commit”. Retain faith that you will prevail in the end, regardless of the difficulties. Confront the most brutal facts of your current reality, whatever they might be. The idea here is that we need to seek and know the truth about our situation. If we’re drowning in debt and out of shape and hate our job, we need to confront those things. But, at the same time, we need to always, always have hope that we will prevail—that no matter what the difficulties are, we will eventually be successful. Confront the brutal facts and retain faith. I loved this chapter because of how applicable this idea is to the movement. The facts of the situation are indeed brutal. Animals are kept in horrible conditions and killed in horrifying ways. There are more animals killed by humans for food now than at any point in the history of the world. (Trillions of individuals, including fish.) We’re not exactly winning the war just yet. And that’s where the unwavering faith comes in. We need to believe that we will be successful, no matter how difficult it is. No matter how long it takes, or how many challenges we have to overcome, we will end animal farming and we will create an infinitely better world for animals. The combination of the two is incredibly important. I see people who only do one or the other. Maybe they confront the brutal facts of reality, but there’s no faith in our eventual success. Without that faith, the facts themselves are incredibly demoralizing and demotivating. Why should we try hard or relentlessly seek the best path forward if we don’t think we’ll be successful? Or, maybe they have faith that we’ll be successful…but they never confront the facts. 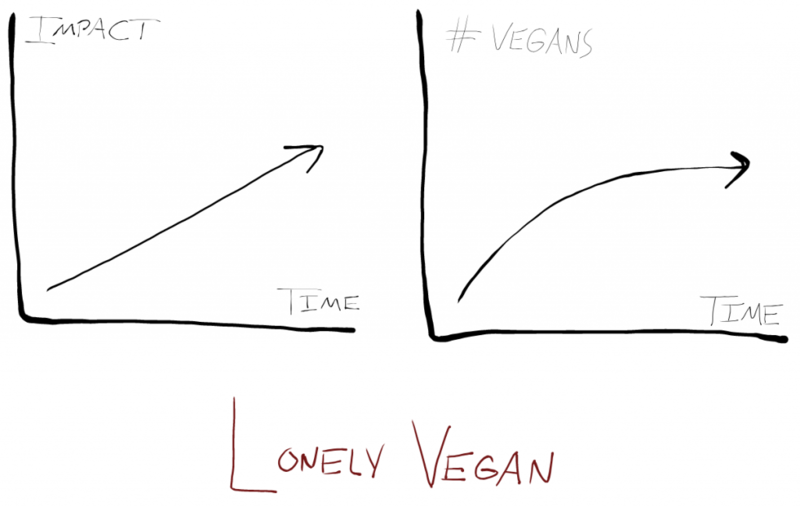 They go around believing that animal liberation is just a year or two away, but they aren’t willing to look at the actual data, ask the hard questions, and make a realistic plan for how to get from point A to point B. I’ve been guilty of this one, definitely—being a prophet of the good news without really diving into the details, just believing what I want to believe about the state of the world. We need both: confronting the brutal facts and maintaining the faith that we will prevail. Finally, we need to embed “truth-seeking” into the fabric of our organizations and our groups. If we punish people for bringing up “brutal facts of reality”, then the truth will go unheard. If we punish people for disagreeing with each other, then we won’t make the best decisions. We have to create an environment where questioning, truth-finding, and debate are encouraged without shame or blame. And the companies who went from good to great? They all had Hedgehog Concepts—a simple, big concept to guide their every action. Confront the most brutal facts of your reality and seek a deep understanding about what lies at the intersection of those three questions. Once you’ve found that intersection, that is your Hedgehog Concept—everything you do from that point on gets filtered in or out by that concept. I think the answer to “what are you deeply passionate about” could start at the same place for a lot of us—we’re deeply passionate about ending the exploitation of animals, ending animal farming. But maybe dig deeper into that question and find what specific areas of this work get you the most excited. Is it corporate campaigns, or creating new vegan products? Vegan outreach? Activist or volunteer mobilization? Local work, or international work? Some would argue that “follow your passion” is bad advice, and I do think there’s probably a lot of truth in that—that interest is built, rather than discovered outright. If you don’t have anything that you’re particularly passionate about right now, try to maintain a deep curiosity about whatever work you happen to be doing at the moment, and keep exploring new things from time to time. You might discover that you can build passion wherever you are, or maybe you’ll find something that you’re already naturally passionate about. Or maybe framed another way, what particular aspects of animal advocacy can keep you interested for years to come? Which do you care about the most? This one is interesting (and potentially a bit confusing), as many of us do our work for free (as volunteers or activists) or as professional advocates in organizations that primarily rely on donors. Some people do work at for-profit companies that have the mission of helping animals. Either way, we all need to generate some kind of income to buy food, pay for rent, etc. Organizations need resources to pay salaries and get resources to do their work. It doesn’t matter whether this comes from profits, donors, or some other source. So the question for organizations is: What is the primary source of your income, and what drives that source? As a specific example, we might look at how investigations drive the economics of Mercy For Animals, or leafleting drives the economics of Vegan Outreach. There’s quite a bit more info about this specific question in the book. For your organization or group (or even yourself), what thing can you be number one or two in the world at? It could be something that you’re already doing, or something that you haven’t even started doing yet. The primary question here is, can you be the best? When we double down on the things we can be particularly good at, we’re able to accomplish what no one else in the world can. By doing this, we add those talents that are uniquely our own, rather than spending time being just good at things many other people are good at. Jim and his research team found an interesting pair of qualities: good to great organizations require adherence to a system, but also give people a lot of freedom within that system. The most important aspect of discipline is sticking to your Hedgehog Concept—what you don’t do is perhaps even more important than what you do. We have a lot to learn from this idea of creating systems that work and then giving people freedom within those systems. Let’s say you’re starting a group that’s going to advocate for banning the sale of animal products in a city. There are two ways you could approach it. The dictatorship way is that you as the leader keep all of the knowledge in your head and you dictate to everyone what they should be doing at all times. Bobby goes off and buys flowers as part of his persuasion tactics—“Never buy flowers again, Bobby,” you tell him, because flowers are definitely not a part of your vision. At meetings, people throw out ideas and you shoot down all of the ones you disagree with and elevate the ones you like. Eventually, people are just task masters for your plan and vision because no one wants to be yelled at anymore and nobody has a framework for understanding why they’re doing what they’re doing. Under a dictatorship, it doesn’t matter how smoothly things run at any given moment—it all falls apart once the top person stops calling the shots. But with discipline, the cohesive processes and structure outlast any one of the people in leadership, and people can thrive in their work as long as that structure is there. If there’s a culture of discipline in organization, then people become free to do good work. Technology doesn’t create greatness, it only accelerates great work. None of the good to great companies started with the mindset of “let’s just find some technology and use that to become great.” In fact, when asked about how they did great work, most of them didn’t even mention technology in their top five reasons. But, very interestingly, many of the companies did use technology as an important accelerator of their work, and many were pioneers of newer advanced tech. It’s not that they didn’t use technology; they just started by focusing on the key issues of getting the right people and focusing in on their Hedgehog Concept. After those pieces were in place, they used the right technology to accelerate. Technology is a wonderful thing. We have a ton of room for growth here. But, crucially, you can’t simply throw modern tech at a problem to make it go away. You have to start with the right people, and you need a deep understanding of what exactly you’re focused on—your Hedgehog Concept. Assuming we have the initial pieces figured out, then it’s time to explore how the right technology can help us accelerate our impact. It’s this exploration that I think we haven’t done such a great job of overall. As a movement, we often rely on sub-par software or websites. We don’t take the time to find the people with the right skills, and we don’t encourage people to learn the right skills. We focus so much on the change we want to accomplish that we stop paying attention to the crucial infrastructure that can help get us there—like good use of modern technology. When asking executives at these companies about any “magic moments” where things changed and they started making the transformation to being great, everyone’s reaction was the same—there weren’t really revolutionary moments like that; there was just a series of decisions and constant work in the right direction over a long period of time. Some of these changes were big, sure, but they came after many hours and weeks of analysis and thought and debate. They weren’t surprises; they didn’t feel revolutionary in the moment. Jim and his research team called this “The Flywheel”—a metaphor of a big stone wheel that is agonizingly hard to get spinning at first, but push after push after push you can add a little momentum until it’s turning at an incredible velocity. These companies first did the work of figuring out which direction they should push: they identified their Hedgehog Concept; they confronted the brutal facts; they started with “who”; etc. After doing this upfront work, they just continued to push in the right direction for years. They added on technology to accelerate their progress. If they made major acquisitions of other companies, it was after they’d already been making progress, to accelerate that progress. These companies didn’t do anything drastic to try to create progress. With this work done, the results showed themselves year after year. They didn’t have to spend much time or energy motivating people or selling them on the future of the company, because people could see it was working. This is contrasted with what many other companies did: “The Doom Loop”. These companies would come in with big, revolutionary changes to get people inspired. But, without the upfront work being done, these changes never really led anywhere. Then they would backpedal and try a different new big change to try to get things going, undoing any momentum they might’ve built up the first time. Rinse; repeat. These companies were very inconsistent, going from one thing to another. They would hop on the latest tech fads without knowing what exactly their core business model was. They would make major acquisition in the hope that it would inspire growth. And because of the lurching back and forth—the lack of momentum, the undoing of any previously built-up momentum—these companies spent quite a bit of effort and energy trying to keep people motivated and selling them on the future of the company. The results weren’t there, and people were constantly changing directions and failing to build up sustainable progress, which was demotivating. The metaphor of pushing a flywheel is appropriate for our whole movement. We push and push, and the flywheel barely moves. We keep pushing, for years—handing out leaflets, running social media ads, running local community groups, protesting, holding conferences, developing new products. Slowly, things start to move faster. We start noticing more vegan restaurants. We start seeing more funding coming into the movement. We meet people who are advocating for animals in countries we’d never expect, as part of groups we’ve never heard of. It’s a great lesson for us as individuals, and for our organizations as well. If we do the work to identify where we can add the most value—what our Hedgehog Concept is—and who we need to be working with, then we can start pushing. We might not see progress at first, but day after day, year after year, we’ll build up momentum until our work is flying along with an incredible velocity. Likewise, there’s a warning here. If we change directions constantly, undoing the momentum we’ve been building up in one direction, we will demotivate people and get nowhere—the “doom loop”. Summed up, that’s what Good to Great is all about. Identify what’s important—get the right people onboard—and push. Know someone who would enjoy this post? Send it their way! And send me feedback if you have any. I’d always love to hear from you.